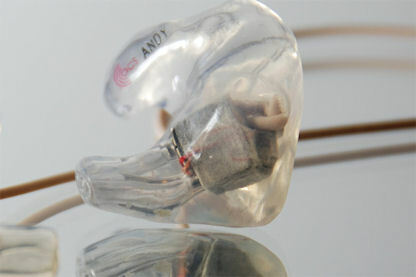 T2™ In-Ear Monitors provide unbeatable clarity, comfort and isolation for those that demand the best audio reproduction. T2™ in-ear monitors are individually crafted from soft silicon which makes wearing and removing them a snap and allows a greater degree of movement for the wearer. Because silicon flexes with the movements of the jaw it maintains more consistent noise isolation of around 26db during vocal performances and as it reaches body temperature quickly you'll soon forget that you're wearing them. The T2™ utilises twin balanced armature transducer technology and an integrated crossover to deliver an incredibly detailed response that extends from below 20hz to 16Khz. Each of the transducers used in the T2™ has been carefully selected to deliver unrivalled range, clarity and depth. Because balanced armature transducers have a high resistance to mechanical shock, coupled with the impact protection of the silicon shield, the T2™ offers consistent performance time after time. The T2™ is wired with teflon shielded cabling and offers a choice of cable exits and lengths dependant on the application. The cable is terminated with a gold-plated 3.5mm jack suitable for connection to almost all audio sources. For the performing musician, the T2™ gives maximum isolation and a limited output making it the safest in-ear monitor on the market as well as the components to give the best performance and durability of any stage monitor. For the audiophiles, the T2™ offers incredible clarity and depth with astonishing comfort and, with 26db isolation from external noise, the ability to recognise every detail at comfortable levels. Available with a choice of finishes, cable lengths and cable exits and supplied in a personalised case the T2™ is completely tailor-made.